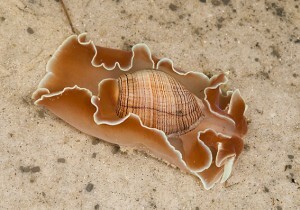 The delicate colouring of the frilled mantle of the living animal clearly shows the basis for the species’ common name. In contrast, the shell itself is covered in fine brown-black stripes and is paper-thin and easily broken (these snails are sometimes known as ‘paper bubbles’ for this reason). The shell may measure up to 60mm in length but is far too small or fragile to offer much protection for the animal which may measure up to 120mm. This species is carnivorous and feeds on marine polychaete (bristle) worms. The Rose Petal Bubble Snail is most commonly encountered in shallow water bays during its breeding season (summer to early autumn) when specimens will lay strings of white, spaghetti-like ropes of eggs. It belongs to a large group of snails and slugs which are hermaphroditic – that is to say, each animal has functional male and female organs. Individuals however still have to mate to ensure cross-fertilization. Once mated, all individuals are capable of laying eggs.